The Freedom Fountain, located at 895 New Bridge Street, is the gateway to downtown Jacksonville. The fountain honors all individuals who have served and are serving the United States of America, especially those who have passed through Onslow County in service to their country. It is a short walk away from Lejeune Memorial Gardens. The Freedom Fountain features a pool with a disappearing edge representing that the flow of efforts to preserve freedom operates continuously. Around the edge are 50 bubblers, one for each state of the union. In the center, the tallest of the fountain jets is the Freedom plume. Around it, are three jets, one for the federal, another for the state and the third for the local governments. The fountain plaza is constructed of bricks that can memorialize, honor or recognize events, persons, groups or activities. A curved wall with arches adorned with medallions for each branch of the military frames the Fountain. Five black marble kiosks positioned around the fountain are etched to tell the story of the Freedom Fountain. Flags representing the nation, state, County and City stand in a flag garden across from the basin. Making the connection to the memorials at Lejeune Memorial Gardens is another flag garden with service flags for each of our nation’s armed services. The Fountain has lights that on most nights beam Red, White and Blue hues through the water. The Freedom Fountain has become the community’s most visual, tangible and meaningful symbol of awareness, interdependence, commitment and appreciation for those who know the price of freedom and who pay that price daily. It also serves to remind us who we live among in our community. Continued Support the Freedom Fountain - Buy an engraved brick to be placed at the Fountain, an Artist Print, or support elements and maintenance. The idea of the Freedom Fountain emerged in response to the first Gulf War, a time when Jacksonville responded to the need to provide help and assistance to military families during the sudden and what was expected to be long deployment. 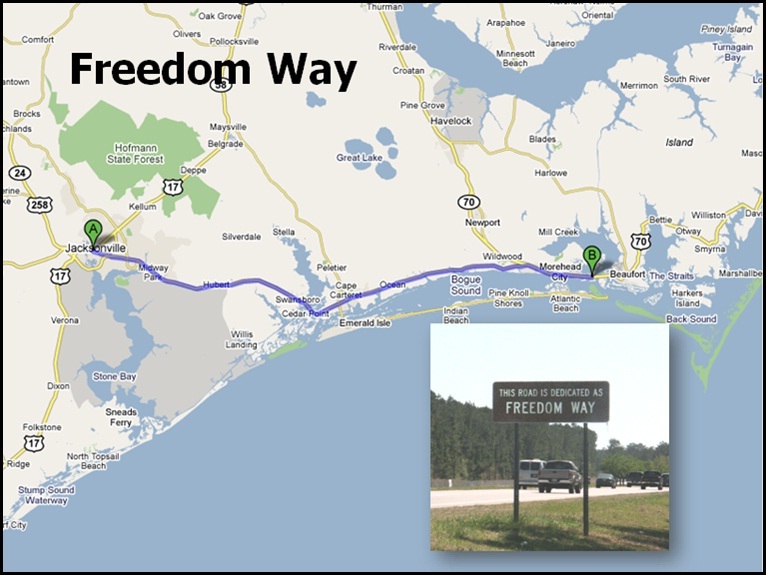 The original Fountain anchored the start of Freedom Way, a designation given to the roads between Jacksonville and the State Port at Morehead City. The concept was to recognize the pathway that so many of our Marines and Sailors took to get from the bases here to be deployed. Neighboring communities along this route jointly supported the recognition effort of our military bases and families, and the port. The original Fountain had to make way for a new building, and an idea was brought forth from the Onslow Civic Affairs Committee to use the property to the East of Jacksonville City Hall. It was agreed upon that the final location for the Freedom Fountain was to be in downtown Jacksonville at Johnson Boulevard and New Bridge Street. It serves as the gateway to the downtown area at Lejeune Memorial Gardens where the Beirut Memorial, Vietnam Memorial, Montford Point Marine Memorial, and the 9/11 Memorial Beam are located. Jacksonville City Council members endorsed a design concept for the Freedom Fountain including input from the community. The design features a disappearing edge fountain basin framed by a curved wall with arches and large medallions representing the five armed services. Flags and fountain jets representing federal, state, and local governments are featured as well as water jets that represent each of the 50 states. A dedication ceremony was held on November 9, 2012 to officially turn on the fountain jets. Each year, the Freedom Fountain Observance is held in November around Veterans Day. This observance tells the history of the current and original Freedom Fountain, the importance of honoring those who serve our country, and provides an opportunity for all communities in Onslow County to gather together to show their pride in a caring community.